Found 21 file extension associations related to Graphics Converter Pro and 1 file format developed specifically for use with Graphics Converter Pro. Developer / company: Newera Software Technology Inc.
Graphics Converter Pro is an easy-to-use and powerful batch graphics converter and image viewer, that can import more than 500 graphic formats and export more than 100 formats including BMP, GIF, JPG, PNG and many others. The program comes with 50 image filters and 12 image effects and more. 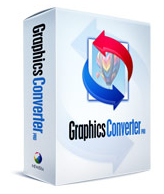 Graphics Converter Pro for Vector supports many vector graphic formats. Now version 2009 supports the conversion between PDF files and hundreds of graphic formats. If you need more information please contact the developers of Graphics Converter Pro (Newera Software Technology Inc.), or check out their product website.